Experience the rush of digging deep down into the earth and uncovering precious jewels and minerals! 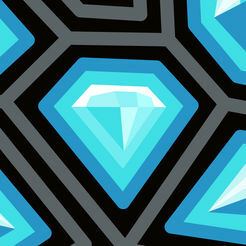 Do you yearn to explore deep below the ground on a hunt for fortune and fame? 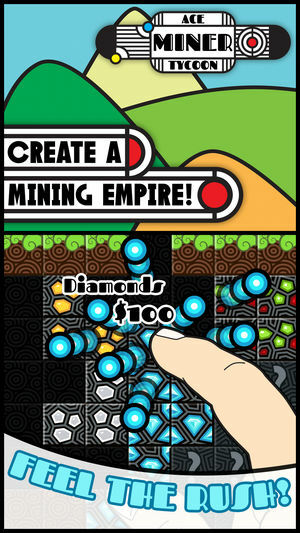 Let Ace Miner Tycoon help you realize your dreams of discovering extraordinarily rich veins of diamonds, gold, silver and more! Made specifically with fans of Minecraft™ and classic tycoon games in mind, Ace Miner Tycoon gives you the chance to build your own mining empire, and have a blast doing it! 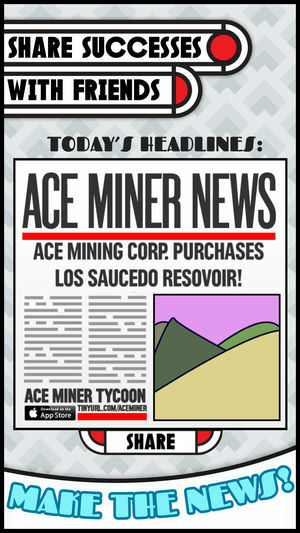 Make the right investments and buy the the right land and you may just become the Ace Miner Tycoon! Fans of shows like Gold Rush, Bering Sea Gold, Alaska Gold Diggers and Storage Wars will be right at home inside Ace Miner Tycoon. You’ll need to make wise investments, not overpay at the auction house on mineral bearing land all while balancing and exploiting your current landholdings if you want to achieve your ultimate mining dreams. Name your company and see its name in the news headlines as you accumulate wealth and treasure beyond your wildest dreams! Build your own mining company from the ground up. 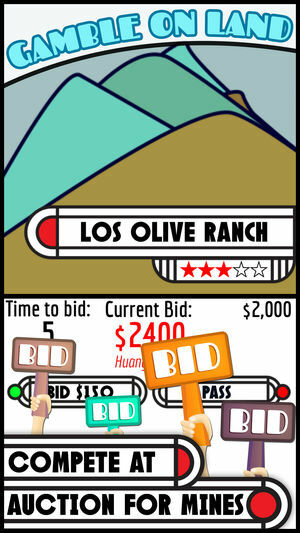 Buy mines at the Land Auction while you compete against other mining companies to win the best mines and find great values! 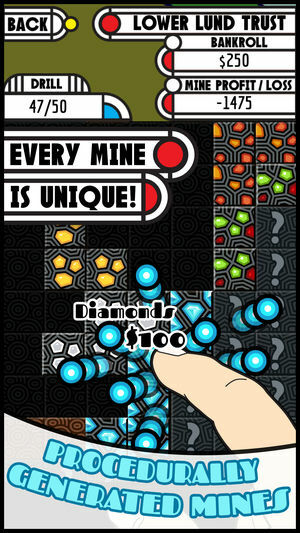 Dig into mines with the easy and innovative “tap to dig” interface, just scroll and dig! No more having to move your miner up and down like other mining games, YOU ARE THE MINER!!! Expand your mining operation with extra mine slots that allow you to work multiple mines at once! Art Deco art style that captures the height of the industrial age and the golden age of mining! Track profit and loss for each mine you invest in! See your company name in newspaper headlines whenever you buy a mine (share the news with friends on a variety of social networks! Change the name of your mining company at any time! Sell your used mines back to earn extra TinyBucks to put toward your next investment!